As the full ramification of the Muslim Brotherhood’s year in power continues to be exposed, a new study by Al Azhar’s Fatwa Committee dedicated to exploring the fatwas, or Islamic decrees, issued by the Brotherhood and Salafis—the Islamists—was recently published. 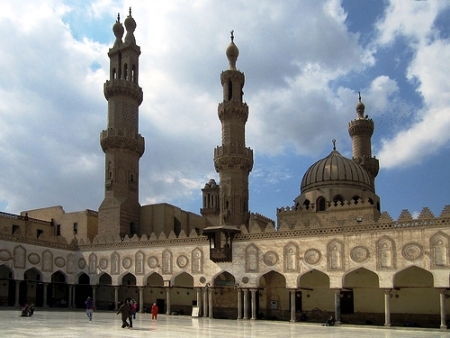 Al Azhar, in Cairo, is considered by many to be one of the oldest and most prestigious Islamic universities in the world. The study, written by Al Azhar’s Dr. Sayed Zayed, and entitled (in translation), “The Misguided Fatwas of the Muslim Brotherhood and Salafis,” reveals a great deal about how Islamists view women. The study addressed 51 fatwas issued during the rule of ousted president Mohamed Morsi. Among them, the Muslim Brotherhood and Salafis “permitted wives to lie to their husbands concerning politics,” if the husband forbids her from being supportive of the Islamists or their agenda; she may then, through taqiyya [dissimulation] a Muslim doctrine that permits deceit to empower Islam, still be supportive of the Islamists while pretending to be against them. Moreover, “Some of these fatwas also forbade women from eating certain vegetables or even touching cucumbers or bananas,” due to their phallic imagery, which may tempt women to deviate. One fatwa suggested that marriage to ten-year-old girls should be allowed to prevent girls “from deviating from the right path,” while another prohibited girls from going to schools located 25 kilometers away from their homes. Another stated that a marriage is annulled if the husband and wife copulate with no clothes on. Even slavery was permitted, according to the study: “the people who issued these fatwas [Brotherhood and/or Salafi members] demanded the enactment of a law allowing divorced women to own slaves,” presumably to help her, as she no longer has a man to support her. An earlier report (summarized in English here) listed some other fatwas issued by the Brotherhood and Salafis during Morsi’s tenure: advocating for the destruction of the pyramids and sphinx; scrapping the Camp David Accords; killing anyone protesting against ousted Egyptian President Mohamed Morsi (which happened and is one of the main charges against the imprisoned Brotherhood leadership); forbidding Muslims from greeting Christians; forbidding Muslim cab drivers from transporting Christian priests (whose clothing makes them identifiable); forbidding TV shows that mock or make light of Islamists; and forbidding women from marrying any men involved with the former Mubarak government. Predictably, the Al Azhar study criticizing the Brotherhood/Salafi fatwas concludes by saying that only al Azhar, which styles itself as a moderate institution, is qualified to issue fatwas. Of course, one of the most sensational of all fatwas—“adult breastfeeding,” which called on women to “breastfeed” strange men, thereby making them relatives and justifying their mixed company—was issued by Al Azhar, but later retracted. And it is apparently this retracting that makes Al Azhar more moderate than the Brotherhood. Meanwhile, the Salafis—who, in light of the Brotherhood’s ousting have become Islam’s standard bearers—continue successfully to push for strict Sharia interpretations, the very sort that justify the above fatwas, in Egypt’s new constitution.